Available on-premises on in the cloud. The entire platform can run from within your network. A 100% on-premises API Fortress deployed with a simple Docker container. Offering complete data security. 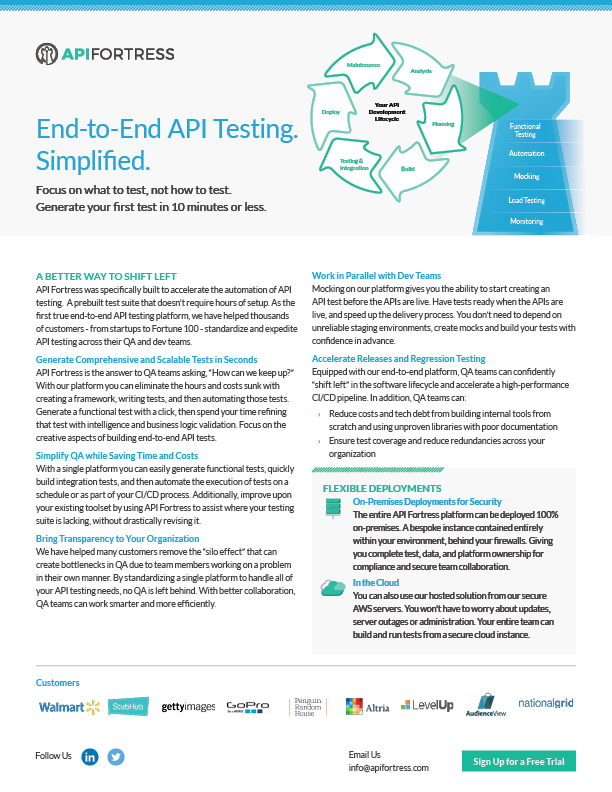 API Fortress was specifically built for detailed multistep tests. Testing a single endpoint is a good start, but your tests should reproduce an entire user flow, which means interacting with various microservices and making sure they work together as expected. See for yourself. API Fortress is based on a human readable markup language. Easy to understand by developers and testers alike, but without constraints. 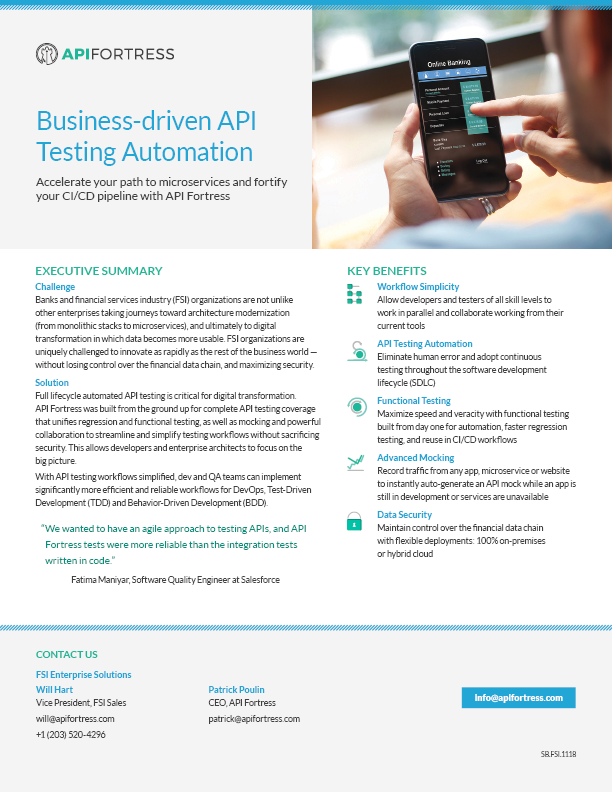 A flexible and robust platform to cover all your testing needs. A detailed real-time status page is generated for you automatically, or we can integrate with platforms such as statuspage.io. Use your existing tests as API load tests. 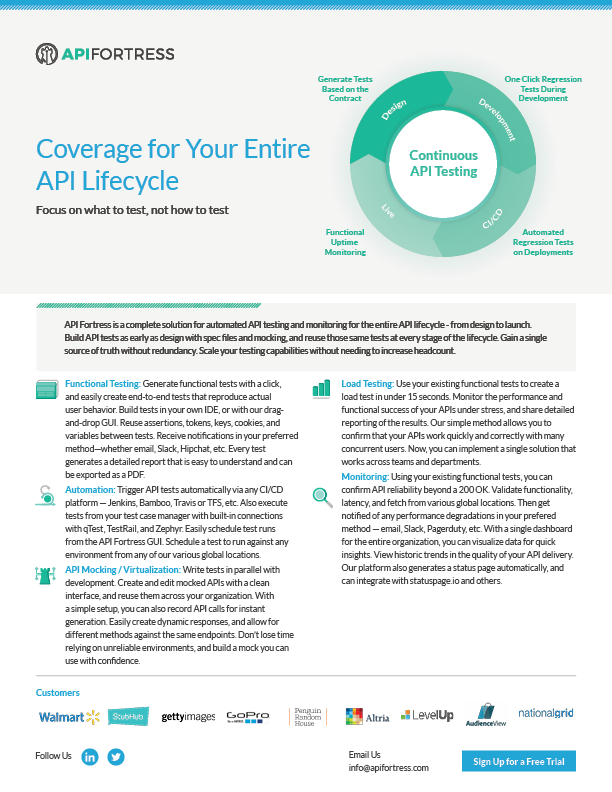 See the performance and functional capabilities of your API under load by thousands of concurrent users. Every test is comprehensive, and thus every report is just as detailed. We store all test results, and the report contains every bit of information related to the test including what passed, what failed, and even the call and payload in case you struggle to reproduce the issue. Take a look for yourself. The API Fortress platform has a dashboard that stores all test results, all performance metrics (latency and fetch), and we even have an API Quality dash which gives you month-to-month comparisons of your endpoints uptime and performance trends.